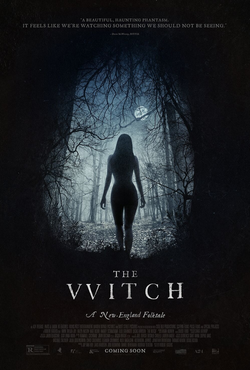 After causing quite a stir at the 2015 Sundance Film Festival, the horror film The Witch has finally been given a general release. It is a genuinely creepy and thought-provoking horror film, one that works as a historical recreation (it takes place in 17th century America), a psychological thriller (you’re never sure who is allied with the witch and who isn’t), and an atmospheric horror film. The film has been critically acclaimed and, for those who care about this sort of thing, it currently has a score of 86 over at Metacritic. For once, I agree with most of the critics. And yet, The Witch is underperforming at the box office. According to Cinemascore, audiences have given The Witch an average grade of C-. That’s sad but it’s understandable. The Witch moves at a deliberate pace, it requires that the audience have at least a rudimentary knowledge of history, and a good deal of its horror comes less from shock and more from the anticipation of that shock. The Witch is a very cerebral horror film and, as a result, it’s not a crowd pleaser. It’s not for everyone. Instead, it’s a film for discriminating horror fans like you and me. The Witch opens with William (Ralph Ineson) and his family being kicked out of a village in New England. William is a deeply religious man and apparently, his style of Calvinism has offended everyone else in the village. After leaving, William and his family end up settling on a stretch of land that is right next to a dark forest. William builds a house and a farm on the land, his wife Katherine (Kate Dickie) gives birth to a fifth child, and all seems right with their world. As quickly becomes obvious, William’s family is not as content as they may originally seem to be. His teenager daughter, Tomasin (Anya Taylor-Joy) and son, Caleb (Harvey Scrimshaw) are both struggling with the burden of growing up totally isolated from the rest of civilization. Katherine secretly years to return home. Twins Mercy (Ellie Grainger) and Jonas (Lucas Dawson) are both rambunctious and keep playing with an aggressive black goat that they’ve named Black Phillip. William, himself, is struggling to make ends meet and has even resorted to secretly selling a silver cup, a present from Katherine’s mother. The crops are dying and the farm animals are just as likely to produce blood as they are milk. And, then, the baby disappears. One day, while Tomasin is playing with him, something drags the baby into the woods and kills him. At first, the family assumes that it was a wolf but we know that it was a witch. If there’s one thing that I wish this film had done, I wish it had left it a little bit more ambiguous as to whether or not there was actually a witch out in that forest. The Witch appears extremely early in the film. The actress playing her, Bathsheba Garnett, has a genuinely unsettling screen presence and provides the film with one of its creepiest scenes but, at the same time, it’s hard not wonder what The Witch would have been like if the audience had been forced to wonder if there really was a witch in the forest or if the family was just being paranoid in seeking a supernatural reason for their increasingly bad luck. And make no mistake about it, things go from bad to worse for William’s family, with William growing increasingly fanatical and all of the children accusing each other of witchcraft. At the end of the film, we’re told that The Witch is based on historical records and that a good deal of the dialogue was lifted directly from diaries, court transcripts, and letters from the 17th Century. The Witch does have a genuinely authentic feel to it. At no point do you doubt that you’re watching a historically accurate recreation of the 17th century. That accuracy works in the film’s favor, giving it an almost documentary-like feel. At the same time, it also means that the audience has to adjust its thinking. This is a film about people who lived in a far different culture from today and, to the film’s credit, the characters react like 17th Century Calvinists and not 21st century film goers. In many ways, The Witch is a demanding film. It’s not for everyone. I enjoyed the film but, for the record, I can understand why a lot of people in the audience did not. (And, I have to admit, that even I occasionally got frustrated with the film’s slow pace. It pays off in the end but The Witch still demands a bit of patience.) Though there are a few shockingly bloody scenes, The Witch is largely a mood piece. Almost of the film’s scares come not from jump scenes but from an unrelenting atmosphere of darkness and doom. Making his directorial debut, Robert Eggers accomplishes a lot with just a few shots of that dark forest, the trees ominously looking down on the humans who have foolishly wandered too far into the wilderness to ever come back. It may not be for all tastes but I recommend taking a chance on The Witch.